Yesterday, British Columbia’s Premier Christy Clark announced that the province will align with Alberta’s groundbreaking new policies on reducing emissions of the potent greenhouse gas methane from the oil and gas industry. Alberta had announced in November a goal of cutting oil and gas methane emissions 45 percent by 2025, and BC’s new commitment is just one more sign that there is growing momentum in Canada to tackle this powerful climate pollutant. Methane is a serious climate threat – with 84 times more potency than carbon dioxide in the short term, it is responsible for about a quarter of the warming we feel today. Globally, the oil and gas industry emits enough methane every year to equal the near-term climate impact of 40 percent of total global coal combustion, and Canada is the fourth-largest emitter of all countries. Oil and gas methane is a big problem, but because of its short-term warming power and the cost-effective solutions available to address it, it also presents a big opportunity to make a real dent in climate change. 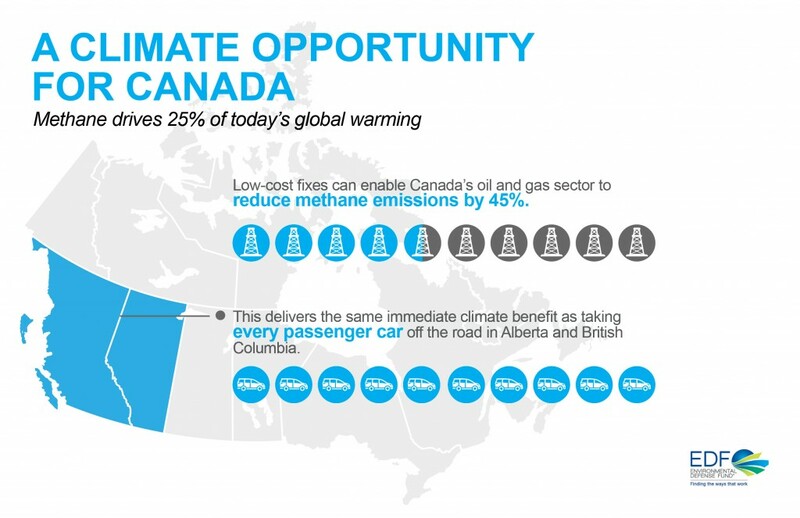 Research has shown that in Canada, reducing methane emissions is one of the most cost-effective ways to address the oil and gas industry’s greenhouse gas impact. A recent analysis by the leading energy industry research firm ICF International found that upstream methane emissions from Canada’s oil and gas industry could be reduced by 45 percent from projected 2020 levels for the low cost of C$2.76 per metric tonne of C02 equivalent – this is incredibly cheap compared to other greenhouse gas mitigation options. And in British Columbia specifically, the analysis showed methane emissions could be reduced significantly for just C$1.69 per metric tonne of C02 equivalent. It’s clear that reducing oil and gas methane emissions makes good business sense, but it also has larger implications for the future of the industry. Investors who have a long-term stake in natural gas are increasingly concerned that if not comprehensively addressed, methane could undermine natural gas’s reputation as a low carbon, cleaner energy fuel. Just today, two leading Canadian investors published an op-ed supporting methane rules in Canada as a good economic move. With Premier Clark’s announcement that BC will take important first steps in tackling the oil and gas methane problem, the province is poised to become a leader on the issue. To show it is committed to true progress, one of the most important steps for BC to take will be setting a strong reduction goal – between Alberta’s 45 percent reduction target and the 40 percent reduction target recommended by British Columbia’s Climate Panel, the province’s leaders have some strong examples they can follow. Both Alberta and the climate panel stressed the need for regulation to reach those goals, and it’s critical that BC incorporate a regulatory framework in its own policies. As we’ve seen before, voluntary measures on the part of industry are not enough to achieve needed reductions — quantitative targets backed by regulations are the best and most effective means for doing so. While industry can’t do this on its own, it must still be part of the process. Clark’s announcement included a commitment to work with industry on this policy move, and that collaboration will be critical to ensuring all players are working together to implement the most effective methods for meeting the province’s methane goals. Beyond just action on methane, there’s more opportunity for BC to continue to be a climate leader by taking action on all of the recommendations by British Columbia’s Climate Panel. Moving forward on the full list of recommendations for policies to reduce CO2 across the economy will continue to demonstrate BC’s climate leadership and deliver solid climate benefits for everyone. Yesterday’s announcement by Premier Clark is a great first step toward establishing BC as a leader on reducing Canada’s oil and gas methane pollution. But BC can’t do the job alone. As Prime Minister Trudeau and his team meet with the Premiers today, oil and gas methane reductions should be on their agenda for actions to reduce greenhouse gas emissions across the country. One recent analysis found that Canada has an emissions gap of 45 million metric tonnes to meet its climate goal, assuming all the provinces meet the targets they’ve established — research suggests that if Canada followed Alberta’s lead on methane, a quarter of that national gap could be filled. That’s about as much of a silver bullet as you can find in the climate world, and suggests that Prime Minister Trudeau would be well-advised to follow BC’s and Alberta’s lead in taking advantage of this opportunity. This entry was posted in Air Quality, Climate, Methane, Natural Gas. Bookmark the permalink. Both comments and trackbacks are currently closed.